I have always been a BIG fan of the space program. I hope we keep pushing money to NASA so we can continue to explore. I saw a great article today about a man and his model rocket. This isn't any model rocket. This model rocket is 1/10 the size of a Saturn V rocket (The same rocket that sent man to the moon.) and weighs 1,600 pounds. It will stand over 36 feet high and be powered by 9 motors equaling over 8,000 pounds of thrust. 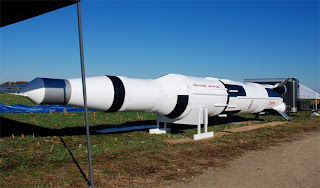 It is expected that the rocket will reach an altitude of 3,000 - 4,000 feet. The guy plans on launching the rocket April 25. I imagine that would be a cool sight to see. I am sure video will be available online. I look forward to seeing it. 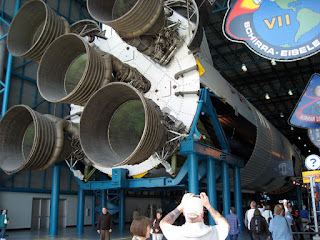 To give you a sense of scale, below is a picture of an actual Saturn V rocket I took pictures of when I was at the Kennedy Space Center in March.